Your time is under attack. You just can’t get enough done. You find yourself wondering where the hours go. You’ve tried every time-management system you can get your hands onand they’ve only succeeded in making your work more complicated. Tate has helped thousands of men and women better manage their time and become more productive. Her success owes partly to the realization that most of us fit into one of four distinct productivity styles: Arrangers, who think about their projects in terms of the people involved; Prioritizers, who are the definition of goal-oriented”; Visualizers, who possess a unique ability to comprehend the big picture; and Planners, who live for the details. How to identify your own productivity style as well as the styles of those around youbosses, coworkers, staff, and family. How to select your tools of the trade” to maximize your effectiveness, from the style of pen you use to the way you decorate your office. When face-to-face conversations are more effective than e-mailsand vice versa. Why a messy desk is right for some, but a disaster for othersand how to tell. 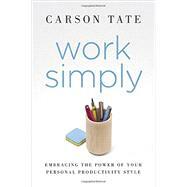 After reading Work Simply, you’ll come away with a productivity system that truly and fundamentally fits youand you’ll never feel overwhelmed again.